A dish wish most of them love it. As I child I use to not like it yes it is true :P. But My son loves it, and I love it because I get a chance to use whatever vegetables I can add to. The below recipe uses the common ingredients, but soon I will post the recipe which I use and cheat my son and hubby to let them eat the vegetables. The below is no onion no garlic, I occasionally make it with onion too. So I have clubbed the recipe here, read below to add onion if required. Pressure cook the potatoes, green peas and cauliflower. Just add enough water to pressure cook. Do not discard the water. Once cooled. Remove the water in a glass. Mash the potatoes, green peas and cauliflower. The mashing should be as per requirement. I mash it completely. Some people like some pieces, or as called in mumbai language, khada bhaji. Puree the tomatoes, capsicum and green chilly. In a big pot or kadai, add 2 tablespoon butter. Add the tomatoes, capsicum and green chilly puree. Let it cook for atleast 5 minutes. Add the mashed vegetables, Pav bhaji masala, turmeric powder, red chilly powder, salt and mix well. Let it cook for 10 minutes on a slow flame. While cooking cover it with a lid, or you will have splatters all around. Add water (the one which we removed in a glass, if less add more water) if required, remember the bhaji becomes a little thick afterwards. Now add 3-4 tablespoons of butter and let it cook again for 5-10 minutes on slow flame. In a big pot or kadai, add 2 tablespoon butter. Add the onion puree and saute for 3-4 minutes. Add the tomatoes, capsicum and green chilly puree. Let it cook for atleast 5 minutes. 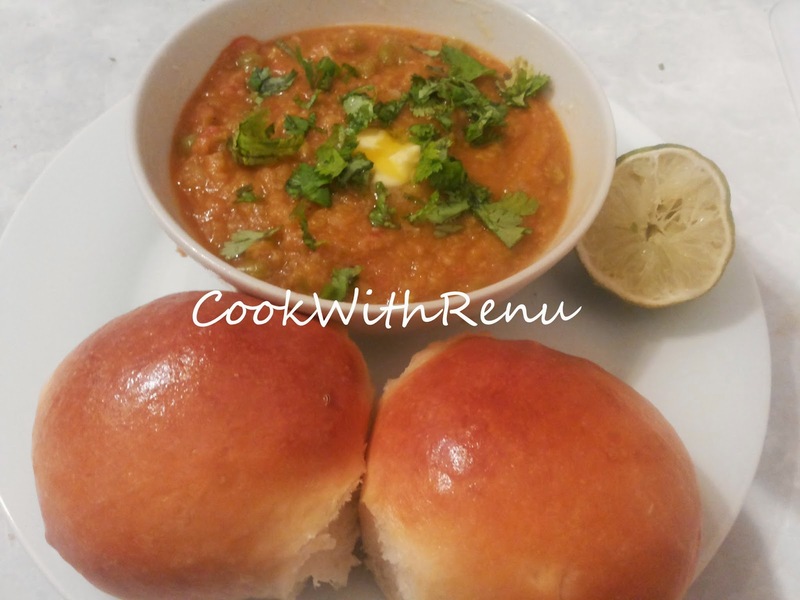 Yummy and delicious pav bhaji is ready. Garnish it with coriander and butter and serve hot with home made Pav. Thank you…you can submit your email id in the text box, on the top of the page. It will deliver the recipe right in your mailbox, whenever a new is published.